SYNTHETIC monostraps for EASE and COMFORT. 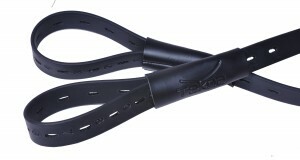 Tekna Dressage Stirrup Straps are a GREAT alternative to traditional English stirrup leathers. One thickness of strap between your leg and the saddle flap is better than two...because there is less bulk under your leg and less opportunity for pinching. These are synthetic and easy to clean with a damp cloth. A durable synthetic coating covers a strong no-stretch webbing strap. The total length is 31.5" (80 cm). For practical use they adjust from 21" to 27" long (53.3 cm to 68.6 cm). They even have a VERY SHORT adjustment, which allows you to run up your stirrups for unmounted exercise or transportation/storage. The price is reasonable and is actually discounted lower than the MSRP.